If you are one of the 4 million+ jailbreakers who set your iDevice free, then you know that the hack triggered the crash of the Weather app, and in some instances also caused the iPhone, iPad or iPod Touch reboot to take longer (reboots getting stuck). But that’s all over now my fellow jailbreakers! As promised, the hackers have issued an update and pushed through the Cydia store for both jailbreak issues. If you haven’t checked yet, you should check your iDevice right now, as you’ll see two notifications about some updates. 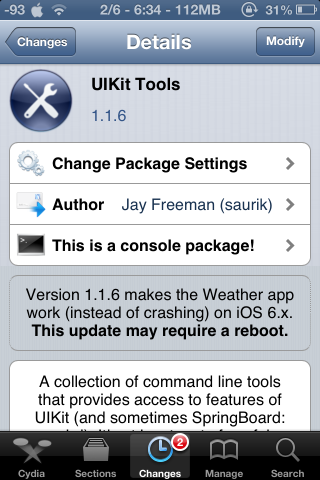 One of them is the UIKit Tools update to version 1.1.6, which will make your Weather app perform as usual. Hit “Modify” and then Upgrade. You’ll be prompted to reboot your device afterwards. The second update is coming from Evasi0n Untether. Version 0.2-3 aims to fix the long reboot problem. If you haven’t updated yet, do it now! AppSync didn't cause weather app problem, but it prevents today's fix from working. Also likely breaks iCloud apps. 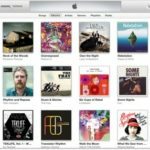 Piracy has costs.